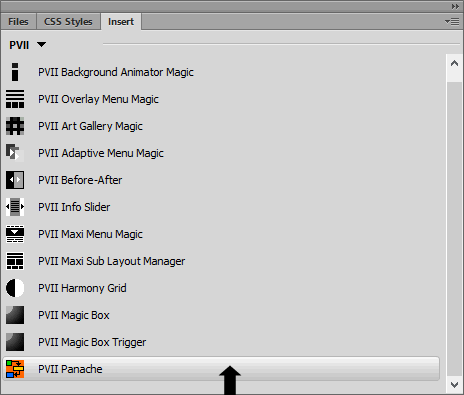 Panache installs into Dreamweaver, giving you access to a fully automated interface in which you can choreograph intricate animation sequences. Animations can be simple effects, triggered on page load, when scrolled to, or when a trigger link is depressed. Animations can also be assigned to multiple elements to tell a story or provide engaging emphasis to a marketing message. 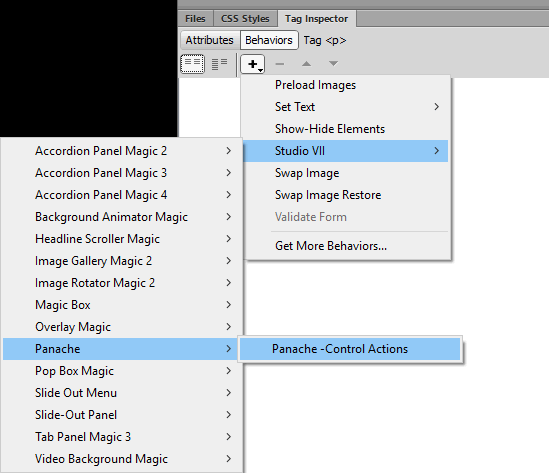 When you create a Panache animation, the system will automatically create the asset files and folders necessary, and link them to your page. The main asset folder is called p7pch. When publishing your site, make sure to upload the entire p7pch folder. There are 3 ways to access the UI. Choose the one most suitable to your workflow. When you open the interface, the system will detect the appropriate mode (Insert or Modify) based on your cursor location. When you are Creating a new animation instance, place your cursor on your page where you want to build it. If Modifying an existing instance, place your cursor anywhere inside the existing animated element and use one of the 3 methods below to open the UI. The system will always open in the correct mode. Switch to the PVII category. The Panache icon should be the last on on the bar. If your cursor is not inside an existing Panache instance, the main UI will open in Create Mode. If your cursor is inside an existing instance, the UI will open in Modify mode. With Panache, you're going to be working with elements that are already on your page—elements such as headings, paragraphs, images, and DIVs, for example. Place your cursor inside the element you wish to animate. To ensure a good selection, you can use the Tag Selector bar that runs along the bottom of your Dreamweaver window. For example, to select a paragraph (like this one), place your cursor inside and click the corresponding <p> tag on the Tag Selector bar. When you select the <p> tag, the paragraph will highlight. Use this method to select any element. You can also use this technique in code view, in which case the entire tag, along with its content, will highlight. When you plan your animations, there are a few things to keep in mind. Implode and Elastic animations should be restricted to a single element, as they do not work well when grouped inside a containing DIV. The Typewriter animation should be limited to content comprised of either headers, paragraphs, or a combination of both. Please click the Run Typewriter link. You can also include bold tags, italic tags, and text hyperlinks. Typewriter animations will work on single elements or elements grouped inside a DIV. Note that you must not place images inside the content that is to be typed. Only text will work. You can even use a span to set a different color. Pretty cool! Some animations require setting a parent element on the page to a viewport. This can easily be done in the Panache interface from a drop-down list containing all of the parent elements of the selected element. The other animations require you to choose a viewport that best renders your animation. For instance, this text is inside a row that has a nearly-black background color. If we wanted to slide in a picture from the bottom, we would want the image to appear to slide up from the lower edge of the row, rather than from the bottom of the page, or worse, from the element's natural boundaries, which are only as high as the image. To accomplish that, we would want to choose the actual element that is colored black, which in this case is our Harmony content DIV. The Image is set to Slide Up on page scroll. Click the red button above the image to replay the animation. The image comes in from the lower boundary of the black row, which is exactly what we want! So, a good rule of thumb is that when sliding from the top or the bottom, select a viewport that is the nearest bordered or colored parent of your animated element. Imploding or Elastic animations are quite unique and eye-catching. To optimize the effect it is key that you choose the appropriate viewport. Let's do a little example and see how it works. Click the button below to bring in a heading using the Elastic Character animation. Elastic Characters are Very Cool! Since we are relatively close to the middle of the page, an appropriate viewport would be the root Harmony DIV (p7HMY_2) that contains the content of this guide. That is, the area between the menu and the footer. This is a good choice viewport choice because the Implode and Elastic animations are staged between 200 and 600 pixels north and south of the element's final resting place. Our chosen viewport, then, will provide an ideal container. Now you can choose the page-wrapper DIV as a viewport. When you open the UI, the system will detect whether or not your cursor is inside an existing Panache animation, opening in the appropriate mode: Create New Animation or Modify Existing PCH: [ID of selected animation]. Select from a list of DIVs on your current page. Remember, the viewport you choose creates the outer boundaries for your animation. Please see Viewport sections above for greater detail. Select this method if you would like your animation to be triggered by a user click or tap. For related information please see the Control Behavior section below. The animation will start when the page loads. The animation will run when the area containing the animated element has been scrolled into view. If you subsequently scroll out of view, the animation will reset and run again each time you scroll back into view. The animation will run once, when the element is scrolled to. Scrolling away from the element will not reset the animation. This is the amount of time the animation will run—from start to finish. The shorter the time, the faster the animation. You can set a delay in seconds. The delay is essentially a countdown, starting when the animation is triggered (either on load, scroll to, when in view, or manually) and counting down from the delay you set to zero. 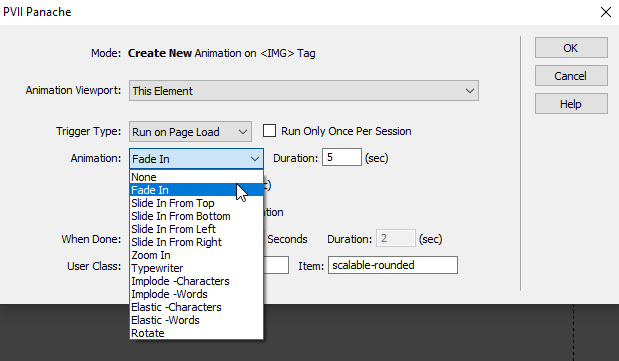 With this option selected, the animated element will fade in as the animation progresses. Naturally, this setting is unavailable (grayed out) for the Fade-In and Typewriter animations. You can set any animation to fade out (disappear) a set time after the animation finishes. You can also set a Duration for the fade-out. You can set a user class on the Root Panache element or the animated Item element. After creating your animation, switch to code view. Make a new paragraph just above the root PCH DIV for your animation, which looks like this. Select the Behaviors tab, then the + sign. This action creates a toggle control. The first click/tap will run the animation. Click/tap again and the animation will replay. This action will stop all animations and set all animated elements to the states they would assume if all animations had run and completed. This action resets all animated content to their initial default states. Tip: Run this behavior for All animations to provide a Skip Animation link. All staged content will be visible. 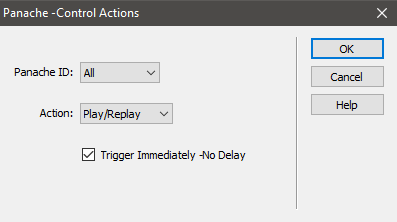 Checked: The trigger behavior will fire and all affected animations will run or stop immediately, without delay. Un-checked: The behavior will use the existing Delay settings from your animation(s). Click OK to build your Control Action link. Double-clicking Panache - Control Actions will open the Control Action UI in Modify Mode. That's it. All other aspects of Panache are fully accessible. The right edge of the UI contains a set of command buttons. The button set will differ by one depending on whether the UI is open in Create or Modify Mode. The Modify UI adds on additional button: Remove.